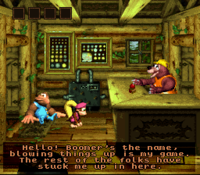 Boomer's Bomb Shelter is Boomer's business in Donkey Kong Country 3: Dixie Kong's Double Trouble!. It is located inside Krematoa, close to the volcano's entrance. Connected to Boomer's Bomb Shelter is a long fuse which stretches around the perimeter of Krematoa's interior. At five key points along the fuse are piles of rocks, where Boomer has positioned bundles of dynamite. Boomer is willing to blow up these rocks for Dixie Kong and Kiddy Kong so that they can explore the levels of Krematoa, but he will not accept Bear Coins like other members of the Brothers Bear; instead, they must pay him in Bonus Coins. In the Super Nintendo version of the game, the first four explosions (referred to by Boomer as "Boomer's Specials"), cost fifteen Bonus Coins each. The final explosion will set the Kongs back twenty-five coins. However, in the Game Boy Advance version, the first four explosions cost eighteen Bonus Coins, while the final one costs twenty-six. This increase is to take into account the additional Bonus Coins that can be found in the new world of Pacifica. There is also a strange machine inside Boomer's Bomb Shelter, which Boomer claims was there when he moved in. Should the Kongs insert the five Cogs they can find throughout Krematoa into the machine, it will increase the world's temperature, causing the Knautilus to rise up from the volcano's central lake. If the Kong's return to Boomer's Bomb Shelter afterwards, they'll discover that Boomer is keeping cool with a fan that he recently purchased at Bazaar's General Store. This page was last edited on April 9, 2019, at 16:54.